How are Educators Using Google Plus Hangouts? As more people join Google's new social network, Google+, they're figuring out how to take advantage of some of the innovative uses for the site. One obvious use for educators is to boost their personal and professional network, particularly as the service offers more granular controls for privacy and sharing. Within these Circles, as each designated group is called, educators and students can create discussion groups without having to worry about the awkward or troubling "friend" or "follower" relationships that come with Facebook and Twitter. But beyond that, Google Hangouts opens up another realm of possibilities for educators. Google Hangouts allows up to 10 people to video chat with one another. Hangouts are free and easy to use (once you download and install a browser plug-in, you're all set). You can invite specific people to join a Hangout with you, although it's worth noting that anyone who joins can in turn share the Hangout's URL and invite others. As being in a Hangout appears in all the participants' Streams, it does mean that these are public gatherings. Google's Hangout technology recognizes who is speaking during a session and that person's image takes the "big screen" while other participants appear in small tiles below. In other words, there's no squinting or tracking to try to figure out where the voice in the video conference is coming from. Video conferencing is nothing new, of course, but the simplicity and the inherent social nature of Hangouts are pretty interesting. Many classrooms have already started experimenting with video chat by using a tool like Skype to bring online guest speakers into the classroom. But with a browser-based solution and with the ability to connect more than just two sites by using Google Hangouts, real-time video-conferencing might become more ubiquitous. Take "Ask an Engineer," for example. 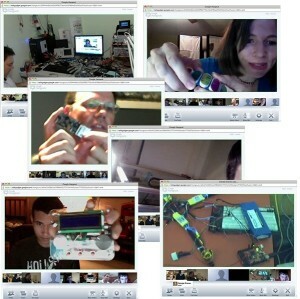 The folks at Adafruit Industries have held video-based meetings for several years now, trying a number of services in order to create a chatroom around electronics and engineering. But with Google Hangouts, "Ask an Engineer" is now more than just one person on camera, presenting to an Internet audience and answering questions. It's become more of an engineering "show and tell." Drawing on the success of the first few "Ask an Engineer" gatherings held in Hangouts, Phillip Torrone asks in an article in Make Magazine: "Are Google+ Hangouts the Next Hackerspaces?" That is, will Hangouts become a place where people can come together regularly to share knowledge and collaborate? As the name suggests, a "hangout" is an informal place, but that doesn't mean that teaching and learning won't happen there, of course. And as the show-and-tell on "Ask an Engineer" demonstrates, we're just beginning to see the innovative ways in which Google+ will be used in educational settings. I asked those who follow me on Google Plus if they're planning on using Hangouts with their students in the Fall, and it's clear that we'll see office hours, collaborative grading sessions, and the like occur via the new video conferencing tool. Teachers: tell us how or if you're using Google+ Hangouts. We'd love to hear your ideas in the comments.